Galileo shook his head. He about witches magic and black magic, but number magic –? That was a new kind of magic. Borghini went to the cupboard and returned with a handful of little white pebbles. Master Jacopo knelt on the floor and motioned Galileo to do the same. Galileo’s eyes widened. This was a strange way for a teacher to act! Most of his friends had told him dreadful stories of their teachers. They all insisted upon strict discipline and were very formal and strict. Yet this teacher was asking him to sit on the floor to play games! Galileo sat, legs crossed like a Saracen. “Now, this is the magic,” said Borghini. He placed one pebble on the floor. That was a passage from the new book I read this week – “Galileo and the Magic Numbers” by Sidney Rosen. I’ve spent a week trying to write this post. Mainly for I was not sure what to write, and partly because I kept getting interrupted. I’m just going to blame the interruptions 😉 . However, after a flood of emails coming through on one of my homeschooling lists, I’m going to take what I liked about the above book and tie it into testing. Galileo was not homeschooled per say, but he was privately tutored for a couple of years, meaning he was taught one-on-one, which is, basically homeschooling. The above passage describes how out-of-the-box Galileo’s teacher was in his teachings and how it impacted Galileo. Galileo ended up going to a monastery to learn for a few years, and then to university. He spent most of his life learning, teaching or in some what associated with a university. For the longest of time (shall I dare say until the past 50 years or so???) each teacher, each school, each chain of thought taught their students differently. It seemed to work just fine. We have benefited greatly from people such as Copernicus, Aristotle, Galileo, Leonardo da Vinci, Benjamin Franklin, Albert Einstein, Samuel Morse, the Wright brothers, Thomas Edison, Graham Bell and Alexander Fleming (discoverer of penicillin) just to name a few. I have not read all these biographies yet, but of the ones I have read about, the education was all very different, and sometimes the person just could not get into learning the way it was taught and seemed like a “bad” student. In the end, we see that each of these people all learned in various ways and contributed greatly to our lives today. This brings me to standardized testing. There is a big push to have standardized testing in the public schools. Public schools in each state are given the curriculum to use for each grade. They are told what to teach. At the end, students take tests to see how much they have learned. It is easy then for each state to compile a “standard” test for each grade, for every child across the state learns the same thing for each grade. A homeschool student does not necessarily learn what they learn in public/private schools at the same time these students learn the material. Is that wrong or bad? Most would agree that not a problem. I have 4 beautiful boys. For each child, I have to teach them very differently, and at different ages I have to teach them differently as well. One child can read to himself or a brother in the same room that I am reading out loud to another boy. Others need to be in a totally different room when I am talking out loud for it is distracting. Some boys can do math in the same room with me when I am busy with another boy, and yet, I have a boy who needs absolute silence and my 100% undivided attention when he does his math – not that I do any of the work for him, he just needs me to sit next to him and make him feel important by sitting there absorbed in only him. The question arises then, what do we do with the standardized tests that some states require? What do they mean? A mother posted that her son was taking a grade 3 standardized test. Someone else was the proctor, and the test was spread over multiple days. The child “finished early” the first day, and did not complete the test, and at the same time, the proctor told her that he put D’s as most of the answers. The mother realized that she never prepared her son for taking multiple choice tests and went over with him how to take them and some tips. The rest of the tests he finished, and chose various letters for answers, but when the test scores came back in, he scored in the lowest 2%. The mother was obviously very upset and concerned about the results. The question is, what do they really mean? Most of the responses stated that in general, the scores are not a reflection of your son’s intelligence, but rather his ability to take a standardized test. Up to this point, he hadn’t had any exposure to multiple choice tests and the testing strategies that go along with those tests. One response was, “I always tell them before we go to testing…I already know how well they are doing in school. We only take these to fulfill the law. These tests will NOT ask a single question about the Bible, good character, Shakespeare, any composer or artist, science that we are currently studying (I don’t follow the public school rotation), geography, famous people or history. So these tests will not test you on about 75% of our schooling. I think the above quote says it all — we all learn differently, at different paces, but the idea is that it all should come together at the end – not the beginning or even in the middle. So what about these tests? Some of us still have to give our children tests occasionally to fulfill state requirements, we cannot get around that. I have given my boys the full battery CAT (10 tests on reading, vocabulary, language, math, science and social studies.) These tests were given for our benefit only, not state requirements. The results of the tests varied. One child aced the tests. On the other hand, I had one child who was a late reader and did poorly on most of the tests for grade 1 and 2 for he could not read the material. After the test was finished and packaged up I asked him the same questions orally and he knew the answers very well, however, the test results came back very poor for obvious reasons. 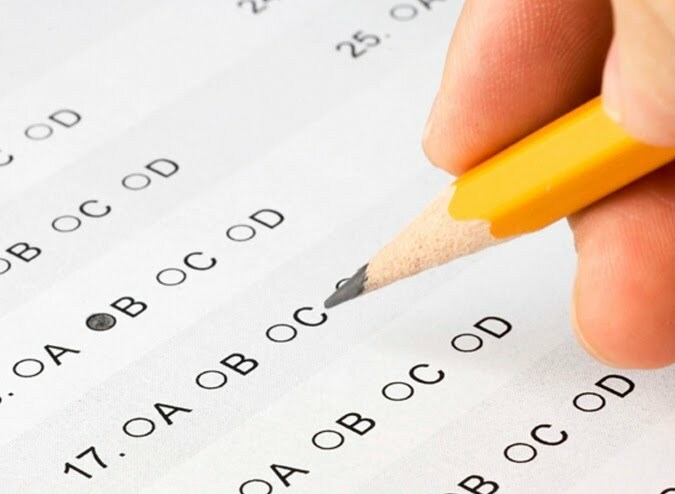 Most people seem to think that for homeschooled students these standardized tests are more for the practice of taking multiple choice tests than seeing how much the student really knows or learned for we are many times teaching different things or things at different times. If that is true, are they a waste of time? I would not call them a waste. If nothing else, they are good practice for later. Almost all kids who go to college will have to take the SAT or other such multiple choice tests and we want to make sure our children are on the same playing level as others for tests. For language and math, the tests seem to be a little bit more relevant, but for my late reader that is not true either. However, other than I know my husband will disagree with me, I would not worry too much about the results if you can figure out other ways to check your child’s knowledge (discussions are great!). If a parent is concerned, try giving tests more often so the child gets used to that form of testing.